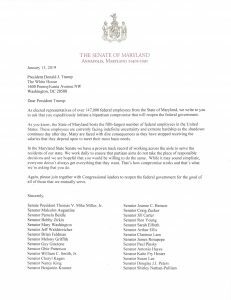 Citing hardship faced by over 147,000 Maryland federal employees, a group of 28 Maryland State Senators today called upon President Trump to initiate a bipartisan compromise that ends the partial federal government shutdown. The group of Senators includes: Senate President Thomas V. Mike Miller, Jr. (District 27- Prince George’s, Charles, and Calvert Counties), Senator Malcolm Augustine (District 47- Prince George’s County), Senator Pamela Beidle (District 32- Anne Arundel County), Senator Joanne C. Benson (District 24- Prince George’s County), Senator Jill Carter (District 41- Baltimore City), Senator Sarah Elfreth (District 30- Anne Arundel County), Senator Arthur Ellis (District 28- Charles County), Senator Brian Feldman (District 15- Montgomery County), Senator Melony Griffith (District 25- Prince George’s County), Senator Guy Guzzone (District 13- Howard County), Senator Antonio Hayes (District 40- Baltimore City), Senator Katie Fry Hester (District 9- Carroll and Howard Counties), Senator Cheryl Kagan (District 17- Montgomery County), Senator Nancy King (District 39- Montgomery County), Senator Benjamin Kramer (District 19- Montgomery County), Senator Clarence Lam (District 12- Baltimore and Howard Counties), Senator Susan Lee (District 16- Montgomery County), Senator Shirley Nathan-Pulliam (District 44- Baltimore City and Baltimore County), Senator Obie Patterson (District 26- Prince George’s County), Senator Douglas J.J. Peters (District 23- Prince George’s County), Senator Paul Pinsky (District 22- Prince George’s County), Senator James Rosapepe (District 21- Prince George’s and Anne Arundel Counties), Senator William Smith, Jr. (District 20- Montgomery County), Senator Jeff Waldstreicher (District 18- Montgomery County), Senator Mary Washington (District 43- Baltimore City), Senator Ron Young (District 3- Frederick County), Senator Bobby Zirkin (District 11- Baltimore County), Senator Craig Zucker (District 14- Montgomery County). The partial federal government shutdown began on December 22, 2018. The shutdown entered its 25th day on January 15, 2019 and is the longest of its kind in United States history. 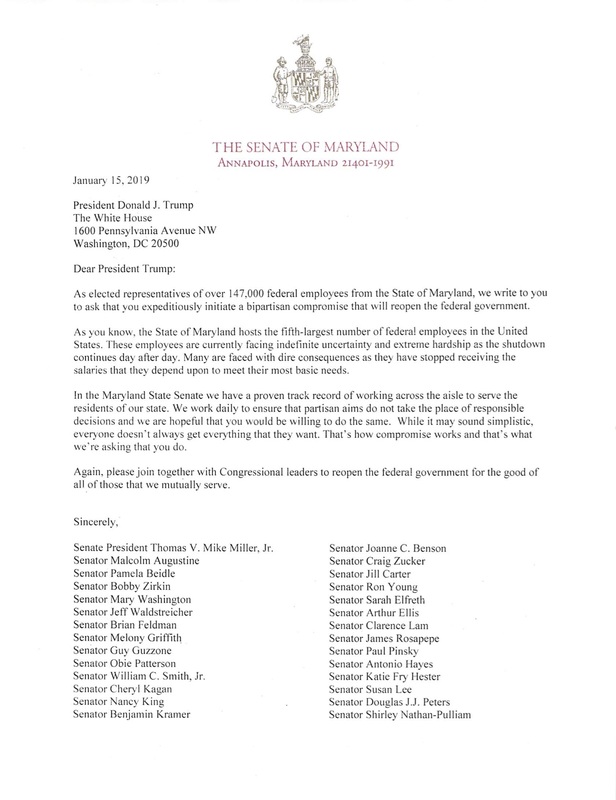 A copy of the letter may be viewed below.